When you are planning your deck one thing that you need to consider is what material are you going to use to build it. Years ago most people used cedar, which is still a good choice, but there are other materials you should consider for your new deck. When we we built our deck a few years ago we looked at a lot of materials including composite decking and a very hard wood called Ipe. One thing that we did that was a lot of fun an educational is to visit a few different deck supply stores and check out the materials they carry. If you have a contractor building your deck, you can visit their suppliers. We were able to get small samples of the composite material hat we could take home and see how the colors matched our house. It is also good if you can find a store that has the wood on display. We found one place that built small decks outside with the different material and you we could see how the material was aging. If you are thinking of using composite decking, here’s good information from TAMKO. (BPT) – Have you ever considered composite decking but disregarded the idea because you felt like you didn’t know enough about it? Maybe you’ve wondered how composite decking is made? Or what kinds of materials make up composite decking? Although composite decking is not new, lack of familiarity with the product may lead you to be confused when making a decision about the type of product you should choose for your deck. To make this decision-making process easier, it often helps to go back to the basics. So what is composite decking anyway? By definition, composite decking is a wood-like product that is created by the mixture of wood fibers, or sawdust, and virgin and recycled plastics. The combination of these elements along with color pigments and other protective additives, form a traditional wood-like decking profile that requires less maintenance than traditional wood decks. 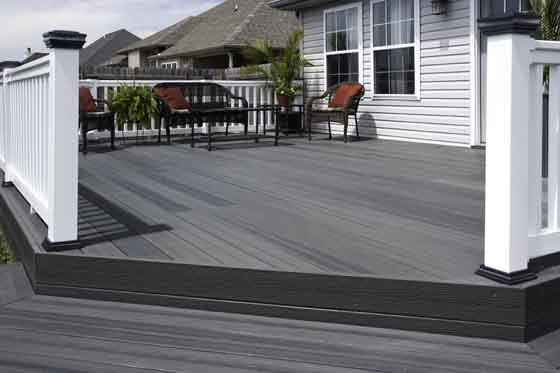 Many composite decking products are manufactured through a process called extrusion. This is defined as a forming process in which melted plastic and wood materials are forced through an opening to produce a product that maintains a relatively consistent size and shape. Think of it like putty that is being pushed through a mold. The opening gives the board the shape and texture. Another manufacturing method is compression molding. Combined molten materials for the composite wood are placed on to wood grain molds which are then compressed under tremendous heat and pressure to create a physical bond. The force applied helps to squeeze out air pockets and create a compressed board. * Weather resistance: The density of a composite decking board helps protect the board from rot and decay caused by prolonged exposure to moisture. By keeping moisture out, this helps reduce mildew, insects and bacteria. * Complementary colors: The composite boards are also manufactured in a range of colors to perfectly complement any home. Instead of needing stain or paint, the colors are already added to the boards. * Durability: Composite decking boards are manufactured to be stain resistant against certain common food and beverage stains, including mustard, ketchup, barbecue sauce, canola oil, fruit punch, wines and coffee. This stain resistance will preserve the life and beauty of the deck. * Maintenance: Composite decking does not require paint, stain or a sealer reducing the overall maintenance of the deck. The best way to maintain a composite deck is to keep it swept, hose it off at least twice a year and attend to stains promptly with household cleaners or commercially available composite deck cleaners. Overall, composite decking is a low maintenance product that has become a desirable alternative for outdoor living. Some composite deck products, like TAMKO’s Envision, even add an extra layer of protection against weather, staining and scratching to preserve the natural beauty of the composite decking board. TAMKO’s Envision is uniquely designed with an added outer layer that is physically bonded to the core board under a compression process. This bonded outer layer adds durability to the core materials that provide the strength and consistency of the board. Envision also comes in four true, multi-shaded color options, designed with color highlights that emulate the textures and natural color variations of real wood to further enhance the natural beauty of the deck. To learn more about TAMKO’s Envision, visit www.tamko.com. Knowing more about the choices available helps you make a more informed decision about the product that is best for you. Composite decking shouldn’t be something you avoid because you don’t know anything about it. Composite decking has come a long way since it was first introduced and can provide you with the beauty and satisfaction you look for in a deck for years to come. You don’t want to miss out.